Hi I am Emilene and I am the creator of Feel Better Now, Inspired by my husband’s rehabilitation with MS (Secondary Progressive Multiple Sclerosis) I decided to specialized on Rehabilitation program Level 6. I work from my studio clinic in Lewisham, Catford area, helping clients with chronic pain conditions, working on the emotional, physical and spiritual paths. Also helping man and women to reach their goals via inch loss treatments pre and post surgery. I help people over 35 who are tired, sluggish and in pain, to look, and feel amazing and pain free since 2012. I have been helping people who struggle with back pain, muscular and joint pain, as well as their health. We would welcome the opportunity to earn your trust and deliver you the best service. Helping you de-stress from busy days and improving your well-being. Oncology Massage & Palliative Care. Conditions I can help you with:– Pre/Post lipo surgery – Fibromyalgia- Chronic Fatigue Syndrome- IBS- Stress- Emotional Trauma- Chronic Pain- Headaches / Migraines- / Menstrual Problems- Carpal Tunnel. We are qualified in many different advanced techniques and we will create a session that is unique for you and your body. We focus on outcome treatments getting you the result you want. This means that we may use a combination of many of the techniques above to create the outcome you desire, whether by reduction of pain, deep relaxation or inch loss. Feel Better Now is a specialised treatment room based out of Lewisham in London. 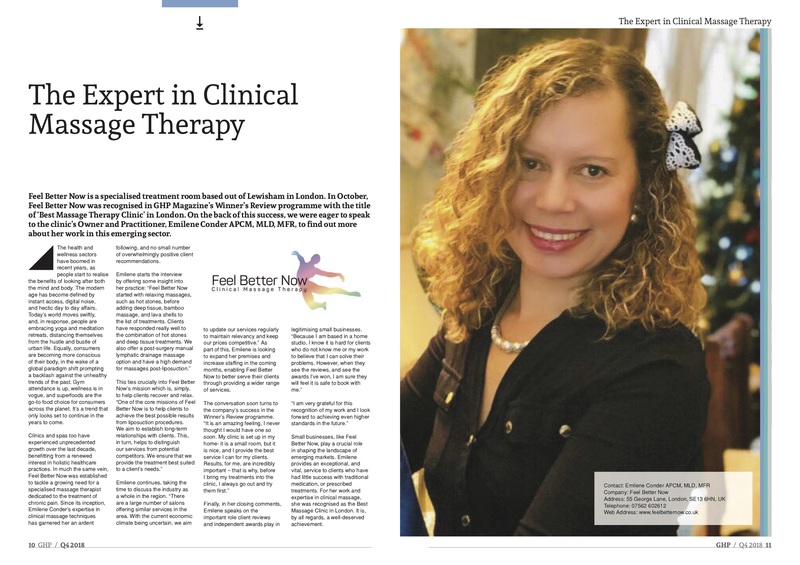 In October, Feel Better Now was recognised in GHP Magazine’s Winner’s Review programme with the title of ‘Best Massage Therapy Clinic’ in London.